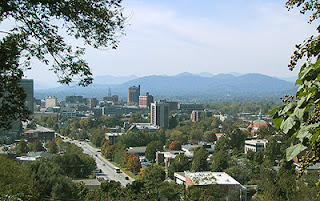 In the family discussion about where we should spend the Christmas holidays this year, Asheville, North Carolina was one of the first cities that came up. This town of 83,000 in the western part of the state has won many awards as one of the best places to live in the United States. It was attractive to us for several reasons: relatively warm temperatures in December, relatively easy accessibility by car or plane, and very good opportunities for amusing ourselves! To find lodging for the four of us for a week, we searched our favorite vacation rental websites--VRBO (Vacation Rental By Owner) and HomeAway--and found a two-bedroom, two bathroom house just ten minutes from downtown. Things were falling into place! As it turns out, Asheville was a very good choice. For one, it has many beautiful old buildings, some in the art deco style which were fortunately unaffected by urban renewal. 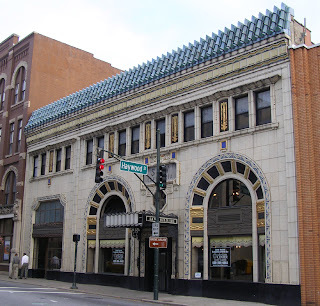 There is an interesting walking tour of downtown which takes visitors by the former S & W Cafeteria (1929), the Basilica of Saint Lawrence (1909), and the childhood home of author Thomas ­­­­Wolfe (1900-1938). The grave of another well-known North Carolina native, O. Henry (pseudonym of William Sydney Porter, who wrote “The Gift of the Magi” among other things), is found in the town’s Riverside Cemetery. Also acknowledged on the walking tour is Dr. Elizabeth Blackwell (1821-1910), a feminist and one-time resident of the city, who was the first female physician in our country and a co-founder of the New York Infirmary for Indigent Women and Children. But the main appeal of Asheville for us is its location in the Blue Ridge Mountains. 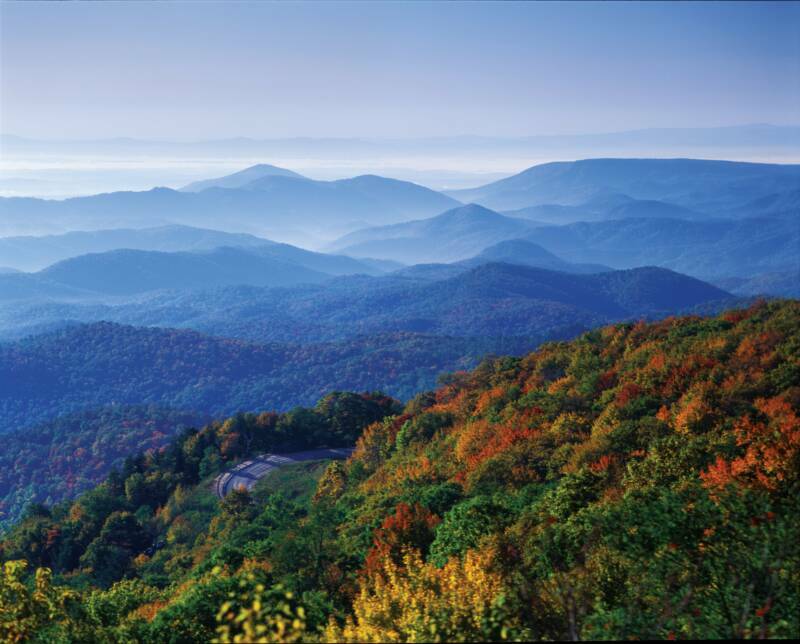 This part of the southern Appalachians is aptly named because of the continual bluish haze over the entire range. On Christmas Eve and Christmas Day we took advantage of hiking close to our rental home. 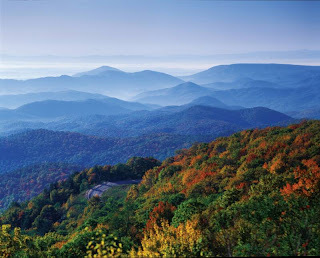 In fact, the scenic Blue Ridge Parkway was practically in our back yard! Our first outing was the quite steep 45-minute trek to the ruins of Rattlesnake Lodge. Built in the early 1900s by school physician Chase P. Ambler, the cabin served as the summer home for the Ambler family until it was sold in 1920 and subsequently burned down. The remains of the lodge are now to be found on the Mountains to Sea Trail which stretches from the Great Smoky Mountains to the Outer Banks. A second, much easier hike was again off the Parkway at Craven Gap. We actually chose this one by default; one thing about the Blue Ridge Parkway that we discovered twice on our trip is that sections of it can be closed off without notice. Anyway, it was a pleasant one-mile walk through the woods on December 25th. Next week I’ll discuss some of the biggest man-made sights of Asheville. We love Asheville. Our son, Andy, graduated from Warren Wilson College, which is near there. We used to go there a good bit when he was there but have't been in a few years. Your blog makes me want to go back soon. Andy lived there after college, too. He visits often as he has so many friends there. Cheapo Snobs uses the "Notepad Chaos v2".